When your pet needs care, we’re here to help. All Creatures Animal Hospital is staffed by a team of nurturing professionals, committed to the health and wellness of animals. We are dedicated providers of wellness care, preventative medicine, internal medicine, and more. Katie joined the All Creatures team in April of 2015. She has a special interest in the care and husbandry of reptiles and amphibians, especially the species of Madagascar. Her other hobbies include traveling, camping, collecting vinyl records, reading, and any form of trivia. Crafty joined our staff as the office cat in April 2008. You may have seen him wandering the halls, sunning himself, or running away from dogs. Crafty has many duties in the office, including entertaining clients in the waiting room, and even consoling grieving pet owners. With his occasionally loud mouth and sparkling personality, Crafty has charmed our staff and clients. Look for Crafty next time you’re in the office. 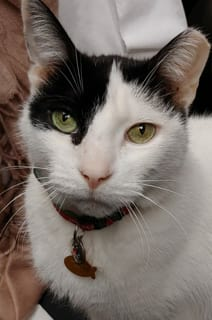 He may greet you with a loud meow or play with your hair while you’re sitting in the waiting room. It’s just his way of saying hello! Anne became an animal lover at the age of 12 when she got her first pets- hamsters named Ethyl & Lucy (who later became Fred after Ethyl had babies!). A few years later, she got her first cat, Sid, and she knew she would never be without a cat again. 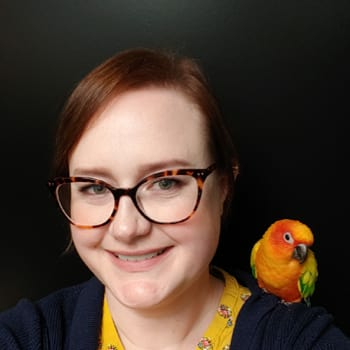 After earning her bachelor’s degree in Fashion Technology from Buffalo State College, Anne quickly realized that fashion was not her true calling and after months of soul-searching, and watching a lot of animal planet, she realized she wanted to work with animals. She soon applied to Medaille College for the Veterinary Technology program and graduated two years later. 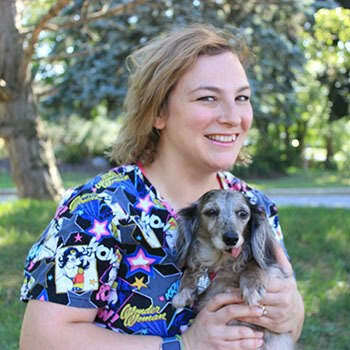 In 2007, she became a Licensed Veterinary Technician and soon began her work at All Creatures Animal Hospital. Anne was promoted to the Lead Licensed Veterinary Technician position in July of 2016. In her spare time, Anne enjoys knitting, sewing, and spending time with Ruby, Holly, Olive and Glue ( her four cats) Nico, Gretchen and Buster, her dachshunds. Bethany has lived in Buffalo her entire life. She graduated from Medaille College in May of 2016 with an Associate’s degree in Veterinary Technology. 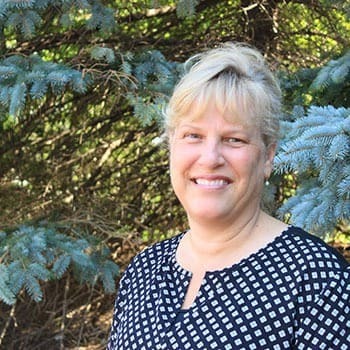 She gained experience in the field at Brighton-Eggert Animal clinic, caring for dogs and cats, and in wildlife at the SPCA during her program preceptorships. Before that, she earned an Associate’s degree in Liberal Arts and Science from Erie Community College . Bethany joined our team in September of 2016. Her love for animals began at a young age at her Grandparent’s farm, feeding and caring for their dairy cows. Growing up she also took care of her Guinea Pig, Sammie. 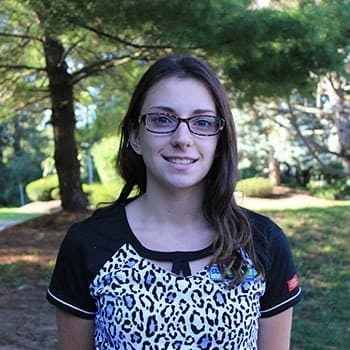 In her spare time, Bethany enjoys playing with her Boston Terrier Libby and spending time with family and friends. Rebecca has lived in Western New York her whole life. She has known since a young age that she wanted to work with animals. After some research she applied to Medaille College to pursue her Associates degree in Veterinary Technology and graduated in 2014. Rebecca's main interest is the care and husbandry of reptiles and amphibians. In her free time she loves hiking with her dogs Bane and Talia or staying in to read a good book with a hot cup of tea. Julie is a Buffalo native. 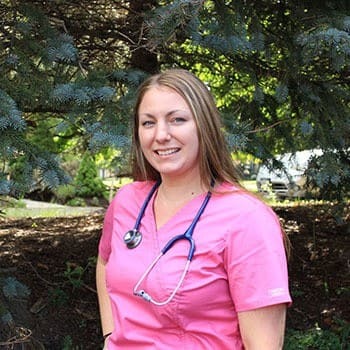 She graduated from Medaille College in May of 2018 with an Associates and Bachelors degree in Veterinary Technology. She first started with us as an intern in 2016, and then got hired on as an assistant before getting her license in July of 2018. She has grown to love all of the species we see here at All Creatures. She has wanted to work in the veterinary field for as long as she can remember. In her spare time she enjoys listening to music and hanging out with her family’s three giant dogs Elphie, Nessa, and Bella and their three cats Hibi, Tucker, and Luna. Brianna moved to Buffalo in October of 2018 all the way from New Orleans, LA. 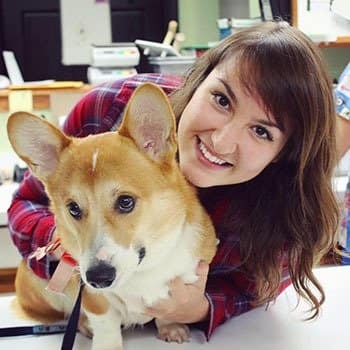 After getting her license as a vet tech, she spent the previous 4 years working at the Louisiana SPCA where she developed a passion for shelter medicine, spay/neuter, and bottle feeding baby kittens. In the spring of 2019, she will be attending Canisius College to study animal behavior and conservation. She dreams of one day working at an elephant conservation center! Brianna is excited about joining the All Creatures team and working with all the exotics we see here. In her free time, she loves hanging out with her soul mate, a torti named Bean. She also loves FaceTiming with her zoo of animals back in New Orleans; 9 kitties, 1 cockatiel, and 2 shih tzus, Gremlin and Chicken Noodle! You never know what other interesting facts lay within a persons life when you first meet them. For example, our receptionist, Janeen, greets you with a smile as you walk through the front door of All Creatures but you would never know that she was once invited to fly down to Orlando, Florida to audition for a Disney Movie and Big Time Fancy Disney Show! Fortunate for us, she followed the road that lead her to All Creatures! Janeen began walking the “pet world” road, when she accepted her first position at a local pet store, running the animal husbandry department. Feeding exotic baby birds and taking care of all the puppies inspired her to pursue a career in Zoology. She attended the Zoology Program at Niagara Community College and completed an internship at the Ridge Road Horse Stables. While working at the pet store, Janeen was also an assistant dog trainer at Eagle Ridge Kennels. Outside of work, Janeen is kept very busy caring for her husband and son and their pets. She loves fishing, boating and hiking! Next time you’re in, return that smile and ask Janeen about her experience singing with the Buffalo Philharmonic Choir! Santa made Deanna’s dream of owning a puppy come true when she was seven years old. A few years later, she received a hamster named Checkers who made the trek across the country with her from Western New York to Texas. She participated in 4-H throughout middle school and high school, and started riding horses when she was nine. She rode on the polo team at Oklahoma State while working towards a degree in Wildlife Management. While volunteering at the Humane Society in Oklahoma, she met the love of her life, Miss Piggy. With Deanna’s training, Miss Piggy has worked as a therapy dog and competed in flyball competitions. After college, Deanna worked for the Houston Zoo in the education department. She decided to return home to Buffalo and took up a job as a manager on a farm for rescue animals. 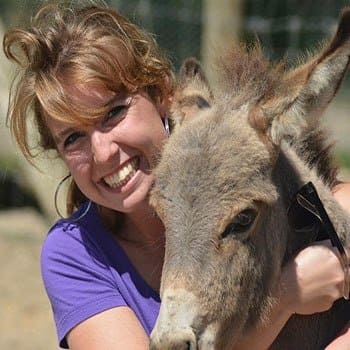 Deanna was forced to give up farm life after kick from a horse left her pelvis broken in three places. Deanna is working on healing still, and enjoys relaxing with her three cats, Miss Piggy, and her off-the-track thoroughbred, Barbara. In August 2015, she adopted a husband and in 2016 she enrolled in the Penn Foster online Veterinary Technology program to further her studies. Megan has called Buffalo home her whole life. She was born with a love of animals and knew early on in life that whatever she pursued would have to involve them. Before joining All Creatures in May of 2017 she was a retail pet store manager at Pet Supplies Plus for 6.5 years. Megan grew up training and competing with dogs in the agility ring and is also an instructor of agility for a few local dog training clubs. She has put over 10 championship titles on her dogs and has competed several times at agility nationals. In her free time Megan enjoys spending time with her dogs, cats, and fish, hiking, kayaking, photography, and competing with her dogs in agility competitions. Victoria was born and raised in Buffalo. She graduated from Niagara County Community College in 2016 with a degree in Animal Management. Through her college career she interned at the Buffalo Zoo, The Primate Sanctuary, and SPCA Animal Control. Her two cats Eloise and Quincy are her best friends. When Victoria is not working you can find her hiking, biking, or kayaking. Bree grew up with a love for animals and knew from a young age that she wanted to do something that included working with them. 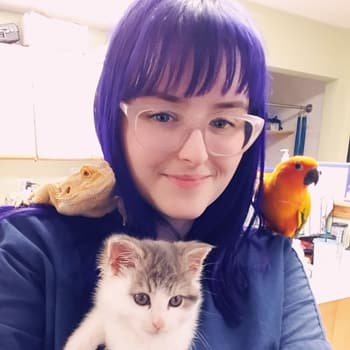 She has a special interest in caring for avian and exotic pets and graduated from Niagara County Community College's Animal Management program where she interned for the Buffalo Zoo, the Niagara Aquarium, and The Primate Sanctuary. 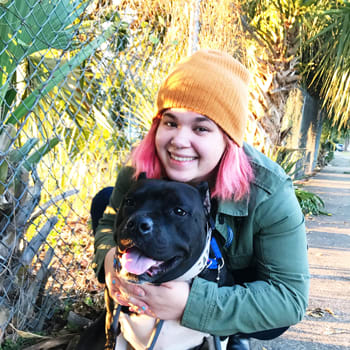 She was previously a supervisor at Blackwinds Pet Supplies and aspires to furthering her education in veterinary medicine by becoming a Licensed Veterinary Technician or by obtaining a degree in the veterinary field. When Bree is not working hard at All Creatures, she enjoys spending time with her dog, Harlow.